Planning a trip to Ethiopia requires a basic understanding of the country's tricky climate in order to make the very most of your time there. The first rule of Ethiopian weather is that it varies greatly according to elevation. Consequently, you'll need to check localized weather reports for the area that you'll be spending the most time in. If you plan on touring around, make sure to pack plenty of layers. In Ethiopia, traveling from one area to another can mean shifting from 60 degrees Fahrenheit (15 degrees Celsius) to 95 degrees Fahrenheit (35 degrees Celsius) in a matter of hours. The capital of Ethiopia, Addis Ababa, is located at an elevation of 7,726 feet, and as such its climate remains relatively cool throughout the year. Even in the hottest months (March to May), average highs rarely exceed 77 degrees Fahrenheit (25 degrees Celsius). Throughout the year, temperatures drop quickly once the sun goes down, and frosty mornings are common. Towards Ethiopia's borders, elevations decrease and temperatures rise accordingly. In the far south, far west and far east of the country, average daily temperatures often exceed 85 degrees Fahrenheit (30 degrees Celsius). Eastern Ethiopia is typically warm and dry, while the Northern Highlands are cool and wet in season. If you're planning on visiting the Omo River Region, be prepared for very hot temperatures. Rain falls infrequently in this area, although the river itself serves to keep the land fertile even at the height of the dry season. Thanks to its location on an elevated plateau, Addis Ababa enjoys a pleasantly cool climate that can be a welcome respite for travelers arriving from the country's desert areas. Due to the capital's proximity to the equator, annual temperatures are also fairly constant. The best time to visit Addis is during the dry season (November to February). Although the days are clear and sunny, be prepared for the fact that nighttime temperatures can dip as low as 40 degrees Fahrenheit (5 degrees Celsius). The wettest months are June and September. At this time of year, the skies are overcast and you'll need an umbrella to avoid getting soaked. Located in the north of the country, Mekele is the capital of the Tigray region. Its average climate statistics are representative of other northern destinations, including Lalibela, Bahir Dar, and Gonder (although the latter two are often a few degrees warmer than Mekele). Mekele's annual temperatures are also relatively consistent, with April, May, and June being the hottest months. July and August see the majority of the city's rainfall. Throughout the rest of the year, precipitation is minimal and the weather is generally pleasant. Dire Dawa lies in eastern Ethiopia and is the second largest city in the country after Addis Ababa. Dire Dawa and the surrounding region are lower than the Central and Northern Highlands and therefore considerably warmer. The average daily mean is around 78 degrees Fahrenheit (25 degrees Celsius), but average highs for the hottest month, June, exceed 96 degrees Fahrenheit (35 degrees Celsius). 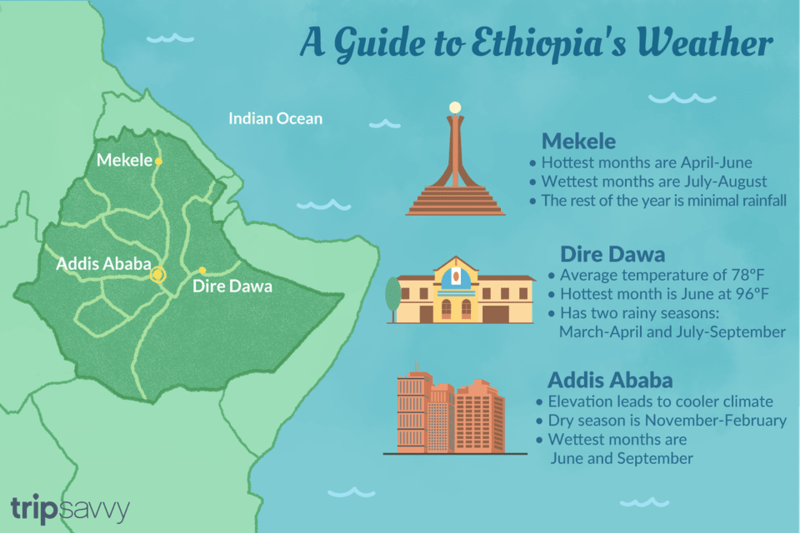 Dire Dawa is also more arid, with most of the rain falling during the short rainy season (March to April) and the long rainy season (July to September). In theory, Ethiopia's rainy season begins in April and ends in September. However, in reality, each area has its own rainfall patterns. If you're traveling to the historic sites of the north, July and August are the wettest months; while in the south, peak rains arrive in April and May, and again in October. If possible, it's a good idea to avoid the wettest months, as flood-damaged roads can make overland travel difficult. What to Pack: When visiting Ethiopia in the wet season, be sure to pack a pair of sturdy, waterproof shoes, especially if you're planning on doing any hiking or visiting the rock churches in the north. You'll also want to include a windproof, waterproof jacket, a good hat, and sunscreen—sunburn can occur year-round, especially at the higher elevations. The driest months in Ethiopia are typically November and February. Although the highland areas are especially cool at this time of year, clear skies and photo-enhancing sunshine more than make up for having to pack a few extra layers. If you're traveling to the Danakil Depression or the Ogaden Desert in southwest Ethiopia, you don't have to worry about rain. These areas are notoriously dry and rainfall is rare all year round. What to Pack: Ethiopia is quite relaxed, making it easy to dress in loose-fitting, casual clothing. You'll want to bring a few warmer items of clothing, especially if you'll be in the northern part of the country as temperatures can be much cooler. Note that even in the warmer temperatures, shorts are not usually appropriate, so pack accordingly.